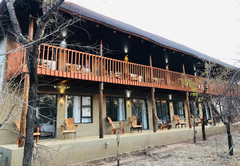 Maqueda Lodge is one of the highly recommended Marloth Park guest houses and provides accommodation in 12 guest rooms for tourists visiting the Wild Frontier region. 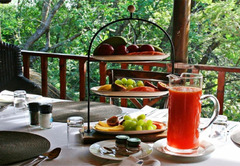 Bordering the Kruger National Park, expect to have all types of visitors during your stay. 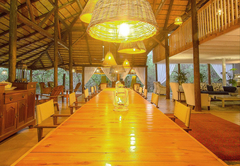 Wild animals roam the premises and we pride ourselves in the abundance of animals in the reserve. 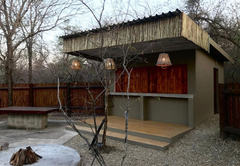 More than 300 species of birds have been identified in Marloth Park, a birdwatchers paradise. 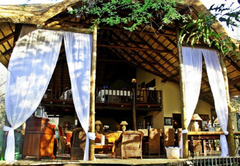 Allow yourself to be absorbed by the peace and tranquillity of the African bush, while enjoying high standards of comfort and cuisine. 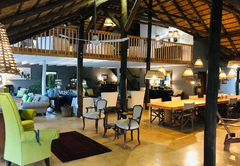 The luxurious and tasteful décor reflects the very African nature of the location and provides the ideal environment for you to relax and take in the views and sounds of the African Bush. 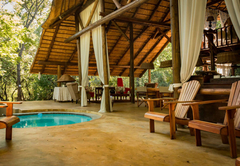 Both the staff and the owners of Maqueda Lodge aim to offer personalised service tailored to the individual. 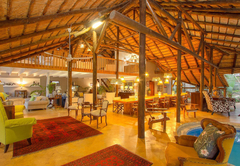 African atmosphere, Western comfort. 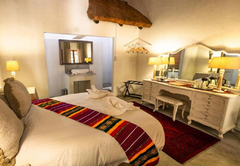 Four luxury double en-suite rooms (2 rooms with twin single beds and 2 with queen-size beds), all individually decorated with ornaments created by local African tribes. 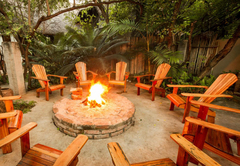 All rooms are accessed via wooden decks and equipped with ceiling fans and mosquito screening. 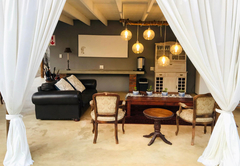 We remain small and personal so our guests can be comfortably accommodated and cared for. 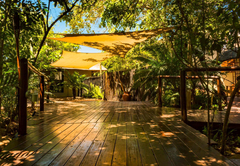 The lodge is situated under a canopy of indigenous trees. 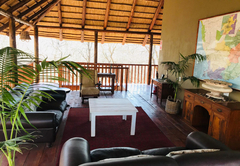 Under thatch, the living areas open to the elements (no windows or doors) and bring the bush feeling indoors. 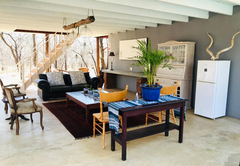 The living area is raised on a wooden deck and surrounds the splash pool. 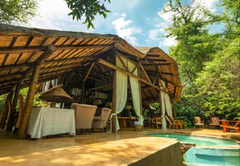 Traditional outdoor boma with its reeded enclosure hosts sumptuous evening meals round an open fire. 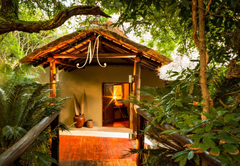 For the free spirited or wild at heart a romantic bush shower is available. 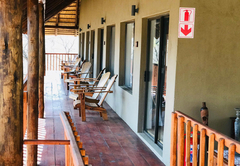 Marloth Park is a proclaimed Nature Conservatory (1500hs) that shares a +/- 17km border (the Crocodile river) with the Kruger National Park, situated between the Malalane and Crocodile Bridge gates. 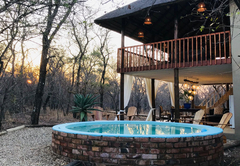 Maqueda Lodge is situated on the southern border of the Kruger National Park with the Crocodile River as border to reserve. 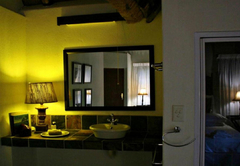 Stylishly decorated en suite (shower and toilet room) with a queen size extra length bed. 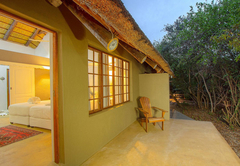 All rooms are individually decorated with ornaments created by local African tribes. 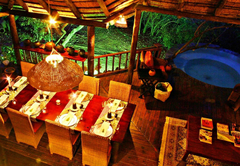 All rooms are accessed via wooden decks and equipped with ceiling fans and mosquito screening. 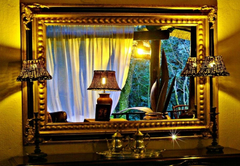 We remain small and personal so our guests can be comfortably accommodated and cared for. Stylishly decorated en suite (shower and toilet room) twin room with two single beds against each other that doubles up as a king size bed. 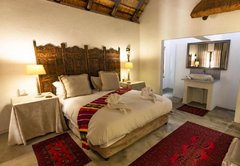 All rooms are individually decorated with ornaments created by local African tribes. 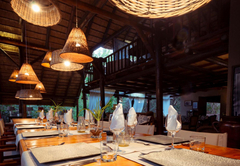 All rooms are accessed via wooden decks and equipped with ceiling fans and mosquito screening. 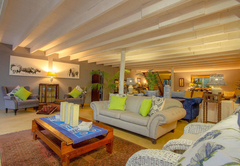 We remain small and personal so our guests can be comfortably accommodated and cared for. 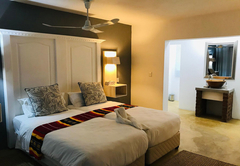 Casita One is an En-suite double room consisting of an inside / outside shower and fully equipped kitchen facilities that sleeps 2 guests. 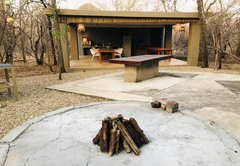 Each Casita has its own braai pit to enjoy your BBQ out in the open looking at the stars. Response timeMaqueda Lodge typically responds to requests in 5-10 minutes. Child policyRegret, no children under 12.